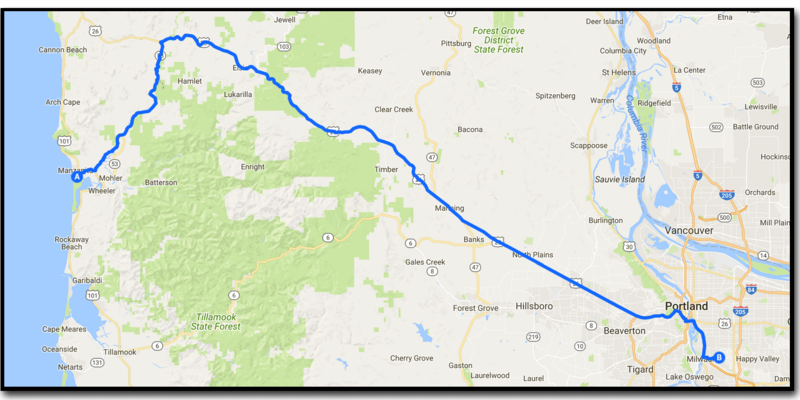 Day Twenty Five, Nehalem Bay State Park to Portland, Oregon. On our way to our Airbnb for a couple of nights in Portland but we have to get the tire fixed first, so it’s off to Scovel’s garage again and a date with out #1 mechanic Andy! Andy fixes out flat and swaps out our spare tire in a flash and we are ready to go on our quick trip over to Portland for our Airbnb. The place is a bit of a shabby basement apartment a little farther from the city center than we would have liked but the hosts are super-nice and we are just happy to sleep in a bed for a couple of nights! Get to the place around lunch time and spend the afternoon doing a 43 km rip around this amazing city. Started off at the bike shop for some tubes and some pints, and then out to see the great network of bike trials this city has to offer. Off for a pint at the Velo Cult bike shop and bike museum. Most enjoyable! Hope your sleep in a proper bed was restful and that you two old friends are ready for the next episode. Keep the reports coming. Be safe. Sending love to you both.